Debt is a “soft” form of slavery. In America today, it is not legal to bind people up with chains and force them to work for you, but that doesn’t mean that there are not millions upon millions of slaves in this country. When you borrow money, you willingly become a servant to the lender. Sadly, there are millions of Americans that will spend the rest of their lives working to pay off their debts but they will never escape the endless debt slavery that they have gotten themselves into. When you add up all forms of debt in the United States at this point, it comes to more than 54 trillion dollars. That is more than $178,000 for every man, woman and child in America. We truly are one nation under debt, and we have created the biggest debt bubble in the history of the planet. Unfortunately, all debt bubbles eventually burst, and when this one bursts the consequences are going to be unlike anything ever seen before. When most Americans think of the “U.S. debt problem”, they tend to only think of the U.S. national debt. Well, that certainly is horrifying, but it is only a small part of the overall problem. The chart posted below shows the growth of total debt in the United States over the last several decades. 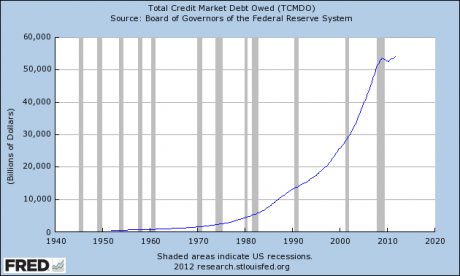 Total credit market debt owed was less than 5 trillion dollars back in 1980, but now it is over 54 trillion dollars…. Our entire economy is now based on debt. We are told that we have to go into debt for everything. Most young adults start their lives by going into huge amounts of student loan debt. Young people are told that they won’t be able to get a good job without a college education, and most of them can’t get a college education without taking out huge loans. Unfortunately, a college education just keeps getting more and more expensive. At this point, college students in the United States are borrowing approximately about twice as much money as they did a decade ago after adjusting for inflation. Sadly, about two-thirds of all college graduates leave school with student loan debt these days. The average student loan debt burden at graduation is approximately $25,000. So before they even start their lives, these young people are drowning in debt. Recently, total student loan debt in the United States passed the one trillion dollar mark. Okay, so once our young people graduate from college they need to get a car so that they can get to work (if they are fortunate enough to find a job). In most cases, that is going to involve more debt. In the United States today, approximately 70 percent of all auto purchases involve an auto loan. In order to make car payments affordable in a world of stagnating paychecks, auto lenders just keep extending the length of auto loans. Right now, the average length of an auto loan in America is close to 6 years. And just like we saw with housing, a lot of these loans are being made to “subprime” borrowers. Sadly, 45 percent of all auto loans are being made to subprime borrowers at this point. That is certainly not going to end well. Once young adults start working, they are encouraged to buy a home. In the vast majority of cases, that is going to involve even more debt. Homes certainly cost a whole lot more than they did in the old days, and most Americans really have to stretch to be able to afford the homes that they live in. In fact, mortgage debt as a percentage of GDP has more than tripled since 1955. That is not economic progress. Many Americans may be living in beautiful homes, but the truth is that the bankers own a bigger share of our homes than ever before. Only in the past few years has it gotten to the point where the bankers actually have more equity in our homes than we do. This is unprecedented in American history. Today, homeowners are only holding about 40 percent of all home equity. Back in 1952, that figure was above 80 percent. One nation under debt indeed. Once our young adults have a home, they have to fill it up with stuff. So that is where credit cards and other forms of consumer debt come in. Overall, consumer debt in America has increased by a staggering 1700% since 1971. Sadly, most Americans have been told about how poisonous credit card debt is and yet they continue to rack up huge amounts of it anyway. Today, 46% of all Americans carry a credit card balance from month to month. Overall, Americans are carrying a grand total of $798 billion in credit card debt, and all of that credit card debt is making the Wall Street bankers very, very wealthy. Credit card debt is one of the worst forms of debt slavery, and yet millions upon millions of Americans cannot kick the habit. In fact, one out of every seven Americans has at least 10 credit cards. When will we all learn? Debt does not build up the middle class. Debt destroys the middle class. Once Americans start getting older and their bodies start breaking down, medical debt starts becoming a problem. One study found that approximately 41 percent of all working age Americans either have medical bill problems or are currently paying off medical debt. Even if you go out and get a “really good” health insurance policy, that still does not mean that you are going to be able to avoid medical debt. According to the American Journal of Medicine, medical bills are a major factor in more than 60 percent of all personal bankruptcies in the United States. Of the bankruptcies that were caused by medical bills, approximately 75 percent of them involved individuals that actually did have a health insurance policy. You may not be able to afford it. Government debt is also a major national crisis. As I have written about previously, state and local governments all over the nation are on the verge of bankruptcy. In the years ahead we are going to see unprecedented financial implosions all over the nation. And the worst debt problem of all is the federal government debt problem. Since Barack Obama took office, the U.S. national debt has increased by more than 5 trillion dollars, and it is rising at a rate of about 150 million dollars an hour. During the Obama administration, the U.S. government has accumulated more debt than it did from the time that George Washington took office to the time that Bill Clinton took office. At this point, the United States has more government debt per capita than Greece, Portugal, Italy, Ireland or Spain. So yes, we are in a massive amount of trouble and yet our politicians are wasting money on some of the most insane things you could possibly imagine. For example, the federal government is actually spending money to determine how rats respond to jazz music when they are high on cocaine. I am afraid that the history books are not going to be too kind to us. We were the wealthiest nation in the history of the world, but that was not good enough for us. We just kept borrowing and borrowing and borrowing and now we have destroyed our future.